Agay is one of the picturesque towns on the Cote d'Azur in Provence, France. When driving on Route Nationale 98 from Cannes to Sant Raphael travelers should stop along the way at the picturesque town of Agay on the Cote d'Azur in Provence, France. 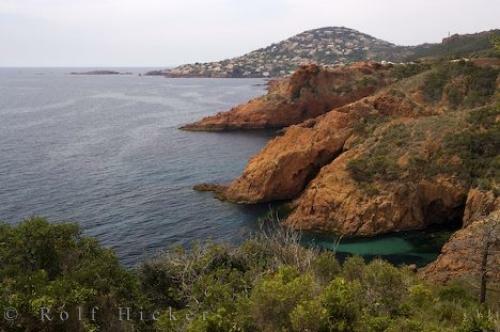 It is believed Greek sailors settled in Agay around 500BC, and one can see why when Agay, resting in a natural bay, comes into view.The bay is about a kilometer wide and the two most popular sandy beaches are Agay Plage and Plage le Baumette. Tourists come from all over Europe to enjoy the quiet ambience of Agay on the Riviera in Provence in France.There are camp sites, hotels and shops and in the centre of town, every Wednesday, there is a local market. During the summer evenings a big antique sale is held. At the railway station there is an hourly service connecting to other towns along the Cote d'Azur, in Provence, France such as Cannes, Menton and Toulon.Town of Agay along the Riviera, Cote d'Azur, Provence, France, Europe. Photo of the town of Agay on the Cote d'Azur in Provence, France, Europe.